Navigating international open adoption has been one of the toughest things I’ve ever done. When we started the process we were told not to expect much help from anyone, but we were confident (and slightly arrogant) that as two professionals we could figure it out. We’ve spent tens of thousands of dollars on multiple paid professionals and not one of them gave us guidance as we tried to figure out how to fill in immigration paperwork. No-one helped us figure out how to provide required documentation that doesn’t exist in our country. No-one helped us figure out which agency to hire. None of them helped us figure out the different laws in different states. No-one helped us figure out the medical information we received when we were matched. No-one has put a stop to the downright horrible things we experienced at the hands of our USA agency (again, I’ll share more about this once the adoption is finalized). We were left to figure out the USA emergency passport paperwork on our own. 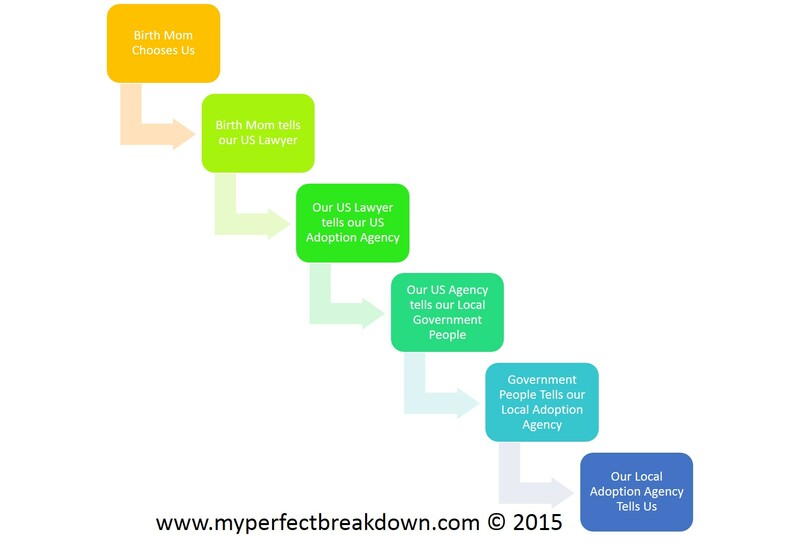 We figured out the inter-state adoption rules largely on our own. We developed our own interview questions for agencies. We developed our own process charts, tables and checklists to try to navigate the process. Essentially, just as we were told to expect, we were left to navigate the adoption process in two countries on our own. I like to think we are doing so successfully. At least so far. When we got home I agreed to be a resource to other families in the international adoption process for our local agency. I wanted to help which meant I dragged Mr. MPB along for the ride (as I often do). We’ve now spoken at adoption seminars for families considering adoption. And, I have had multiple one-on-one conversations with prospective families and families already in the process. But, now it seems our local agency is referring virtually all new couples/individuals considering international adoption or in the match process to me. I’m essentially getting weekly calls. And, while it’s nice to help, I’m getting starting to get tired of it. I want to help, I truly do. Please don’t get me wrong. But, I have limited time. I’m a new mom and I’m a working mom. I think it’s fair to say that my spare time is somewhat limited and has become very precious to me. I’m not sure how to draw the line, but I do feel that a line needs to be drawn. Also want to know why the local agency isn’t able to do some of this themselves? Isn’t this partially their role? Or isn’t this part of the role of the agency in the foreign country? Or the lawyers? Seriously, with the amount of money being spent shouldn’t this be someones paid job? Maybe formulate a template/pamphlet/handbook type thing and hand it off. Of course you want to help, but realistically it’s a lot of repeat info? Compiling it could be the best bet? I mean really…if they are referring people to you, then you should be on their payroll. There’s a difference between being nice and wanting to be helpful, and being referred to by an AGENCY that should be doing this stuff themselves!!! It’s great that you want to help out, I’m not trying to diminish that at all…but they’re completely taking advantage of you! Agreed with earlier comments. If they are sending people to you for information then they need to be paying you for your time. What a kick in the pants! Heeeeeeeeeey maybe they could hire you? Maybe this is your “why”… why did the miscarriages happen, why did the adoption happen the way that it did. You have the power and the knowledge to help people… families… who are just as frustrated as you once were. Maybe they’re just not as capable to pull all resources in the way you did, or as organized. You can be the one to make this less scary and frustrating for someone. And that, is amazing. Ha – I could like all these comments! They need to hire you or pay you a monthly fee for X number of referrals, etc! I admire you for being a resource, though! It makes my heart happy to think you are already helping other families. That’s fantastic!!! I would start with the agency. Explain that you’re getting overwhelmed by the referrals, and that since there’s so much demand, maybe the agency should consider training their own people to handle these inquiries. You could offer, if you want, to help with the training, or to help develop materials (maybe a Frequently Asked Questions list) or something like that. Or, if you’re willing, maybe you can lead a group meeting once a month for anyone with questions. It’s great that you want to help, but it’s unreasonable for them to expect you to handle such a large volume of calls as a volunteer. You would think someone somewhere is being paid to guide people through this stuff. It is so wrong that they aren’t. Nice of you to help. Maybe you could put together an FAQ and have that handed out initially and then if they still have more questions they could get in touch? Not sure what the solution is but can see how it must be so frustrating. I agree with all the people who have commented here. I’m still catching up on your last month of posts so maybe you get to this later BUT I wanted to add that there are “consultancies” in the States that work as the adoptive (vs adoptee) advocates. They do precisely what you’re describing here and charge a fee. It’s not a huge fee in terms of the cost of adoption and we found our consultant insanely helpful with navigating all the ins and outs. There’s mostly asynchronous contact with only one or two “in-person” meetings so the time commitment on their part seems low (although they obviously spent a lot of time on preparing resources). I bet you could do something similar. (I can email you more details about how the one we use is set up if you want.) Short version: you should get paid for this!